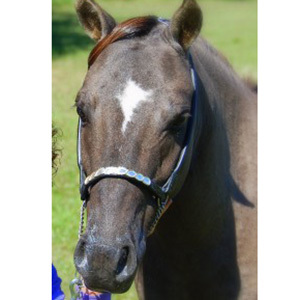 Smokey is one of two currently registered miniature horses in North Star Therapy Animals. Smokey’s handler Carolyn says he has an amazing ability to sense when people need more time with him. He will seek out rooms to visit when the team is at the nursing home. Smokey is never in a hurry to leave the room – and will stay for as long as people want to pet him and talk about how handsome he is. Smokey loves the attention he gets at summer school programs. Most of his visits are at nursing homes where his calm personality does wonders for the residents. Carolyn described a time Smokey looked eye to eye with a man in a wheelchair and never moved while the man held Smokey’s face in his hands. The man had not spoken for months. After they went home, Carolyn received a phone call from the facility saying the man couldn’t stop talking about Smokey for the rest of the evening. When he’s not visiting, Smokey likes to run around the pasture playing chase with the other two resident miniature horses. He also likes to pull his cart and his sleigh – especially through the woods and fields. Sometimes Smokey also goes to miniature horse shows to compete for ribbons and prizes – we think a special guy like Smokey deserves all of them.